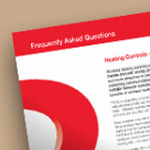 Our FAQ section covers some of the key questions that are often asked on heating controls. FAQs covering topics such as You and Your Heating Controls, Wireless Controls, Room Thermostats and Zoning. Click the icon or the document title to download the pdf.